We've been enjoying ourselves in Belhaven, North Carolina. 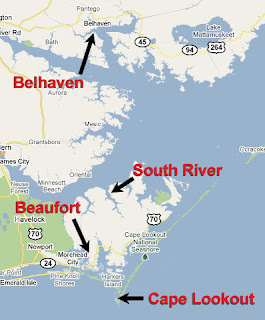 Belhaven is just off the ICW at mile marker 135. The town is behind a huge breakwater that is about to be re-built. The anchorage has room for hundreds of boats and we've seen as many as 20 anchored here over some nights. There are a couple of marinas and a new condo complex. It's a nice town with a lot to offer. We've been coming here since 2003 when we brought aCappella down the ICW for the first time. This is the first time we stayed here for multiple days though. We've mainly been waiting for good offshore weather. Wind and wave predictions off the coast of North and South Carolina have been outside our "comfort zone." No big deal. 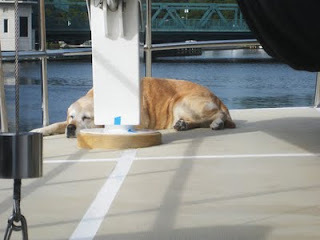 We've gone grocery shopping, taken the dogs off the boat a couple of times, toured around the harbor on the dinghy and worked on ActiveCaptain. The front that brought all the bad weather is slowly passing by. 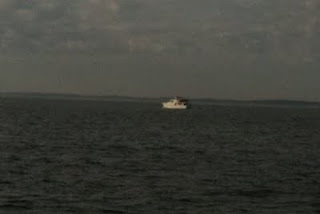 We'll get to either Cape Lookout or the South River tomorrow. 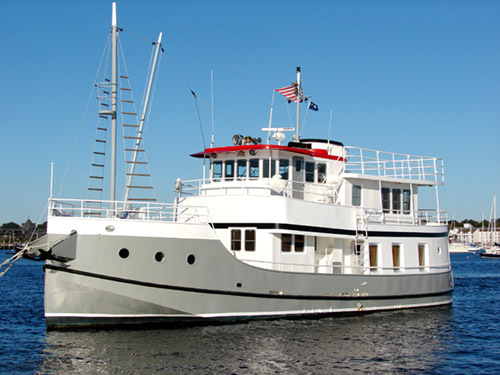 By Monday, we should be at Cape Lookout either way - a beautiful hook off the coast of Beaufort, NC. The calming trend looks like it'll continue and we'll be able to take off to Charleston on Tuesday. 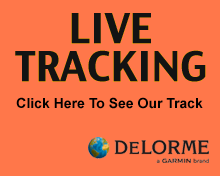 If the weather is very calm, we'll continue onto Brunswick, GA where we'll be sitting for a couple of months, ending this third phase of our cruise. So we're quietly cruising down the ICW in North Carolina when we hear over the radio, "aCappella, aCappella - this is the Mary Kathryn, are you out there?" Well, this was a nice surprise - it was Bob Smith from the Annapolis area. So we switch channels, talk a bit, and yadda, yadda, yadda, he's anchoring in Belhaven too and invites us to dinner aboard his boat, kids included. Kids included! We object but he insists. 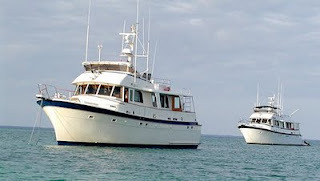 This would be a first - Dyna and Dylan out to a dinner party aboard another boat at night - and a dinghy ride after dark. It doesn't get more exciting than this. After anchoring in Belhaven, getting situated and cleaned up, we loaded up the dinghy and navigated to Mary Kathryn anchored nearby. Gail prepared a wonderful stuffed flounder and vegetable/jasmine rice. 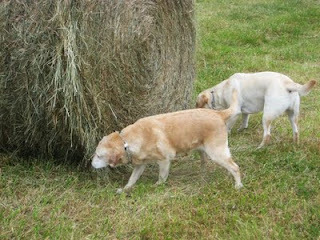 Dyna and Dylan enjoyed fresh ice and Charlie Bear treats. I have to honestly say that everyone behaved themselves. Dyna and Dylan too. Notice the nice black-and-blue bruise on Karen's right thigh. That was awarded in Great Bridge when she walked into the bulwark door of the boat. It has been a spectacular array of colors changing each day like the leaves turning colors all around us. Although I said "ICW smile" in the video, it's correctly called an "ICW moustache". Either way, it's a nasty thing to remove and everyone has their own special techniques and formulas to get it off. We've all been there. They're so cute with those big soulful eyes. You say, "Oh, I'll just take a look," but then they snuggle up to you, give you a kiss, and you just can't resist adopting them. I adopted my people two years ago. In the beginning it was great! They loved to cuddle and learned my food and bathroom routines pretty quickly. It was touch and go there for a bit when this little interloper showed up but I got him in line pretty quick. We'd settled into a very happy routine. They loved their walks in the morning. I took them out to play in the afternoon. I even let them sleep in bed with me at night – I know you're not suppose to but they just love to curl up with me and there's those eyes they give you. It was great having them around. So when they wanted to go on this boat trip it was hard for me to say no - their little eyes looked so sad. I let them know that if they really wanted this then they were going to have to do all the work. They've fussed a bit here and there but all in all they've been pretty good. That was until this morning. Now we've done some silly things these past couple of months and I've just gone along and didn't complain. But this was just expecting too much. This morning they had their little alarm go off at 5AM and jumped right out of bed eyes bright and all raring to go (well, sort of). And the little twerp's right there with, "If you want to go, we'll go." He makes me sick sometimes. Well, I wasn't done sleeping but they finally made such a racket it was easier to just get up than lay there. Next thing I know we're pulling away from the dock in the pitch dark and heading down some narrow little canal. They didn't even bother to make me my breakfast first. Where's the gratitude?! All of this nonsense so we could go around in circles in front of a bridge and then go around in circles in front of a lock. Well, by then I'd had enough. Finally they pulled into Great Bridge Lock and I figured it would be an easy jump to the wall and I'd be out of there. I even had the twerp convinced. But then I saw them there looking so cute. How would they get on without me? Geez, I'm such a sucker for those eyes. 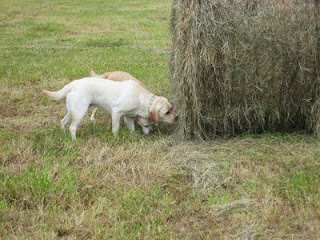 Besides it's a lot of work to train new ones. We left Olverson's to continue working our way south. Friends of ours from Vero Beach onboard a Krogen trawler named Fluke were anchored on the Great Wicomico River at Rogue Pt and we thought it would be nice to share the anchorage with them. We didn't know how cold it was going to be. Wicked cold. Richmond, Virginia broke their all-time record for cold last night. 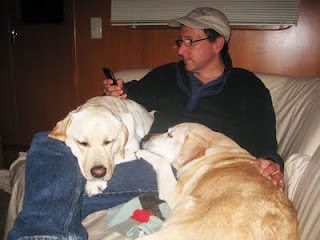 For me, checking email on the settee was pretty nice with two dogs tired after moving just 30 miles down the bay. Karen, on the other hand, was complaining of being cold. It's hard to believe that just this Tuesday we washed the whole boat wearing T-shirts and shorts. By Wednesday we wore long pants for the first time during the day. By Thursday we were wearing socks. Socks! That's not supposed to happen when cruising south. It's cold and rainy and windy and just miserable. 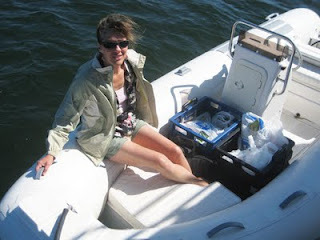 So we fired up the boat's heating system and got everything warm over a couple of hours. Karen turned happy. The comforter came out on the bed and we rushed down to get under the covers earlier than usual. 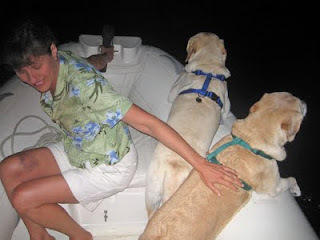 The only problem for us was that it was a three dog night and we only had two dogs. You know the TV commercials showing dogs diving, arms outstretched into water? Well that's Dyna. She's a beautiful diver. 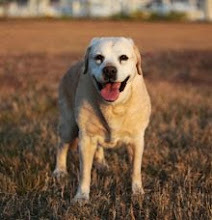 She does it often, sometimes even when just running into the water from the beach. With iPhone in hand, we captured a mini dive during today's swim. 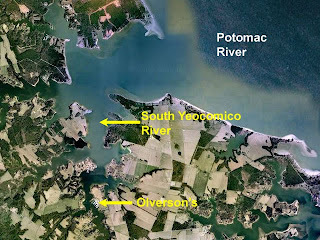 Tomorrow we're heading to a marina in Virginia to get water, go grocery shopping, and explore the other side of the Potomac. 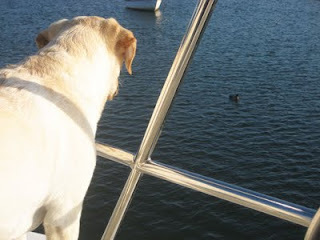 There probably won't be diving for a couple of days but marinas are interesting to the canine crew in many other ways. Our time at St. Mary's has been nice. 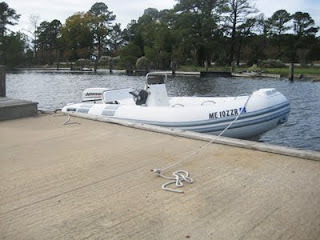 During the mornings we work on some boat projects, the web site, and new software. I've been doing a lot of work on finishing the next version of the interactive guidebook called "X". It's a major re-write and has some really nice capabilities based on working with ActiveCaptain for almost 4 full years (and hundreds of suggestions). Karen has been re-working all of the articles online by updating them with the latest information available. She's also been handling the enormous number of user-updates we've been receiving lately. But...after lunch...the dogs know what's coming next - Swimming. It's their most favorite activity. We've been going to a nice beach on the college campus. 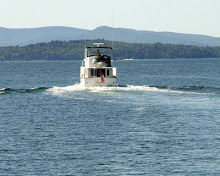 The school's boating facilities make it easy to pull up and the water is really nice there. 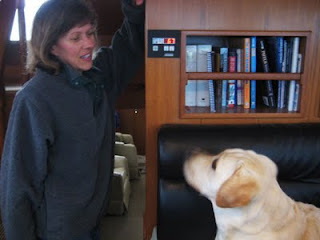 Back on the boat, the team is exhausted giving us real quiet time to do more project work. I've been able to get a lot done during these days. It's been the perfect environment for software development. Dylan is a thoughtful dog. At home, he'll watch birds and squirrels for hours. 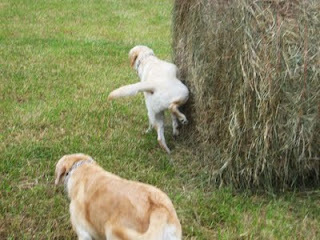 He studies their movements and occasionally gets to chase one. But here there are no windows. For Dylan, he gets to experience nature up close and personal. While we've been busy in Solomons meeting people, having dinner out on other boats, having people over to our boat, and enjoying a variety of other social events, Dylan has been watching ducks. Here at the "Solomons - 2" anchorage they cover the water. They swim all around the boat and can't understand why we're not throwing food to them. Dylan studies their every move, quietly standing watch and hoping they'll move closer. If degrees were ever given out to dogs, Dylan would be due a PhD in ducks. The people onboard aCappella have been very busy too. 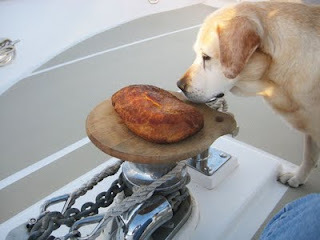 With the end of TrawlerFest yesterday, we were finally able to do some normal errands and household tasks. 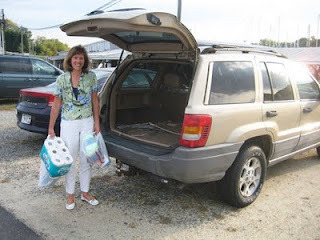 This included laundry, walking to the large grocery store that is further away, walking to the closer grocery store (for ice cream reserves), walking to the fish market, and walking to the pet supply store who carries our special dog food in 30 pound bags saving us shipping costs later. It was a lot of walking but it was a beautiful day with crisp, cool 70 degree sunshine. It's funny how little walking is done any longer. While cruising, we're forced to walk often. I have to admit that we were offered cars by 5 different people here in Solomons over the week - the cruising community is small and friendly and we know a lot of people here. We appreciate the offers and would make use of them in a heartbeat in an emergency. For normal needs though, walking is OK with us. We have these two wonderful Rolling Carts that carry groceries and fit well in the dinghy. We bought a fair amount of food today, filling the carts. 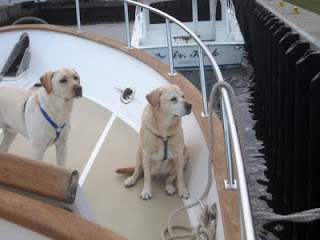 Arriving back at the boat we were greeted by two wagging tails. 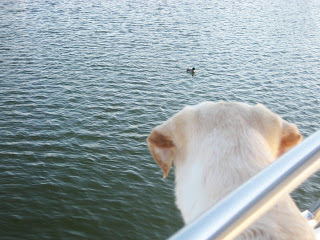 Given the choice between fresh food and ducks, even Dylan goes for the food.